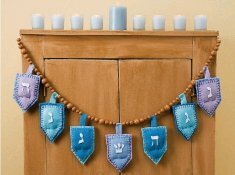 Decorate with this festive Homespun Hanukkah Garland from AllFreeSewing.com. You can also find a whole list of Jewish Holiday Projects at AllFreeSewing. Sew up a quick gift bag to hold chocolate gelt, coins, or dreidels with this tutorial for embossed Gift Bags for Hanukkah from Better Homes & Gardens. Stitch up some festive coasters for the holidays with this tutorial for Hanukkah Coasters from The Purl Bee. Create bright banner decorations for your home with this tutorial for Handmade Hanukkah Decorations from Better Homes & Gardens. Make a Dreidel Quilt Block or a Hanukkah Candle Quilt Block with these tutorials from Favecrafts.com. Craft a Dreidel Plushie with this tutorial from Cut Out + Keep. Use freezer paper to create a dreidel printed t-shirt with this tutorial from downtoearthnw.com.